The Carbon Tax really is the zombie, body snatcher legislation that will not die. The past couple of months have seen a massive ramping up of pro-Carbon Tax activities by the VPIRG led coalition, Energy Independent Vermont. These folks have gone into overdrive, stacking public forums with Carbon Tax advocates and filling local papers with letters and op-eds pressuring Governor Phil Scott to “be a leader” and pass a Carbon Tax. All this activity reached a peak on November 8th when a group unveiled what they are calling “The Essex Plan” – another major proposal to tax Vermonters for driving our cars and heating our homes. No particular organization has its name on The Essex Plan, but it does list thirteen authors from across the climate activist spectrum. The group includes David Mears, former Commissioner of Environmental Conservation, Jon Erikson of the Gund Institute, Rick Hausman, a former State Representative, plus several high profile business owners who, most if not all, appear to by linked to Vermont Businesses for Social Responsibility (VBSR). As such, it is worth noting that VBSR recently hosted a pro-Carbon Tax informational meeting and has upped its profile in support of passing some sort of Carbon Tax. The Essex Plan (the significance of the name is not explained) would ultimately be a $240 million tax on gasoline (32¢/gal), heating oil and diesel fuel (though not dyed diesel) (40¢/gal), and natural gas and propane (24¢/gal). In this respect it is “better” than the VPIRG plan, which topped out at over a half a billion. Fifty percent of this revenue would be used to subsidize Vermont’s electric utilities for the purpose of lowering electric rates, and the other half would be redistributed to low-income and rural Vermonters via a rebate scheme. The authors state that the electric subsidies under the Essex plan would mean $8 million in savings for a company like IBM, and would “slash” the bills of ski areas, which use lots of electricity to run their lifts. While we support making it cheaper to do business in Vermont, and very much want these businesses to succeed on their own merits, it is not desirable to make it so by forcing taxpayers cut these companies a check. This is what the Essex Plan effectively does. Would you support, for example, any increase in the gas tax if the stated purpose was to subsidize ski resorts, or Global Foundries, or any other business? If your answer is “no,” then you do not support The Essex Plan. It is also ironic that the authors tout the Essex Plan as “billion dollar ‘Buy Local’ campaign,” when the businesses they cite as benefiting most are not locally owned. For example, Stowe is owned by Vail, Killington is owned by Utah based Powdr, Okemo is owned by a Florida based company, Ben & Jerry’s is owned by Unilever, Global Foundries is headquartered in California. In fact, Green Mountain Power, which would receive the bulk of these subsidies directly as it controls roughly 78% of Vermont’s power distribution, is owned by the Canadian company Gaz Metro. Again, we like all of these companies and want them to succeed, but on their own and without handouts from the taxpayer. The Essex Plan is just one Carbon Tax proposal that will be up in 2018. In the closing weeks of the 2017 legislative session, legislators put forward four different Carbon Tax bills, H.528, H.531, H.532, and H.533, which their sponsors said are designed to “start a conversation.” Funny, we thought that conversation was concluded when Governor Phil Scott trounced Sue Minter on the strength of promising to veto any Carbon Tax. Nevertheless, here we go again. Add me to your list of people that will testify if needed. Also, anything else that I can do. These idiots are going to ruin this state. It is already in deep trouble. This is not a gas tax with a subsidy for certain businesses, this is a free market approach to make electricity sourced heating and transportation more attractive for all Vermonters. Why is the Ethan Allen Institute arguing against a proposal that would bring VT businesses and families the lowest electricity rates in the region for the mere cost of 32 cents a gallon phased in over 8 years? We see those types of fluctuations in gas prices in a week as it is now. This is the type of incentive that we need to attract the type of low carbon business here that we need as a state that imports 100% of it fossil fuels. Thanks for the comment Jack, but yes, it IS a gas tax that will directly subsidize a certain business: electric utilities. Green Mountain Power, which provides roughly 78% of the state’s electricity, is a Canadian company, so I think the plan’s authors claim that this is a “billion dollar ‘buy local’ campaign” is highly misleading. The authors of the report are the ones bragging about how much IBM (now Global Foundries) and the ski resorts are going to save as a result of being the indirect recipients of these subsidies, so it seems fair game to point it out. I pay a Carbon Tax on my home heating oil bill, gasoline, etc… the government taxes my money and cuts a check directly to the power companies… the power companies give it to their customers via artificially low electric rates, the largest of whom are the businesses mentioned in the report and above. You even admit in your post here that the point of this is to be an “incentive that we need to attract the type of low carbon business…” So, what you’re admitting whether you realize it or not, is that this is designed to be a taxpayer funded subsidy to attract electricity dependent businesses. To call the Essex Plan a “free market” approach is flat out absurd. The definition of a free market is one in which transactions are voluntary and absent force or fraud. Nobody is voluntarily paying this tax; they are being forced to do so by the state. The state is flagrantly picking winners and losers, hobbling some players and giving advantaging others. There is nothing free market about this at all. Why would we oppose this? Why wouldn’t anybody who can do math? You only point to one half of the equation — lower electric rates. But Vermonters would be buying those lower electric rates with much higher prices for gasoline, home heating oil, etc. You would take 100% of our tax money and return only 50% via lower electric rates. Sorry, not jumping for joy here. The rest would be redistributed to low income and, doubly, low income rural Vermonters. Those whose incomes disqualify them from the rebate scheme will get absolutely hammered. That is a very narrow view of what the “free market” is. What about the billions of dollars in federal subsidies for fossil fuels using our tax payer money? Why doesn’t that anger you too? A utility is also not a “company,” they are designed to be regulated by the state, that’s what makes it a utility. Most businesses and people are already “electricity dependent,” this plan just advocates for that electricity to be more affordable relative to fossil fuels and sourced from cleaner, more local options. If we had to be dependent on one rather than the other, I choose electricity which we can source right here in Vermont using clean, more affordable methods and produced by increasingly innovative Vermonters contributing to OUR economy, not war torn countries ran by dictators. So everyone except low income Vermonters would “get absolutely hammered”? You mean the people who can afford to transition away from fossil fuels on their own, and many of them already have? (Because it saves them money in the long run). These are the people that proportionately burn way more fossil fuels than low income people but comparably pay much less percentage of their total income. Jack, that is not a narrow definition of “free market,” it is THE economic definition of a free market: where people engage in voluntary transactions free of force or fraud. Subsidies for fossil fuel companies? We don’t support those either. A utility IS a company. It’s called “the electric company” for a reason. Gaz Metro, the Canadian company which owns Green Mountain Power and Vermont Gas (78% of all Vermont’s electricity market) is a publicly held (ie investor owned) privately held limited partnership corporation. In other words, it is a $7 billion private company with a fiduciary responsibility to maximize profits for its shareholders. There’s nothing wrong with this, but why would we want to cut them a taxpayer funded check for $62 million a year? What makes a utility a utility is that it is granted a monopoly by the government in exchange for accepting a great deal of government regulation. It’s an arrangement fraught with cronyism. You dismiss the people who will be hammered by this tax as those who “can afford to transition away from fossil fuels on their own.” Frankly, who the hell are you to say what someone else (people who may be saving for retirement, paying for kids’ education, investing in a business, dealing with health costs, etc.) can or cannot afford. And who the hell are you to force them to do something they otherwise would not choose to do. Which gets us to choice. In your post above you state what you choose. “I choose electricity.” Good for you. You have made your choice, and you should be allowed to pursue it. But in a free society, you don’t get to choose for me. I may choose something else. If you believe in a free society, you accept and you deal with that. But you clearly have no tolerance for others to make a choice different from yours. You want to use the power of government (which is a form of violence) to force those who disagree with you into compliance with your choice. You don’t believe in a free society. You’re advocating for a police state with Jack as dictator. No thanks. I’m rather happy that I no longer live in Vermont (after dwelling there for 17-years). I do miss VT, but am happy-as-a-clam, in Montana. Clams, here, are expensive, but my $0.0685/kWh residential electricity rate is fine, in my all-electric home. It is also wonderful to not be ruled by Communist-Socialist-Progressive loons! Any attempt to say Vermont Government seeks to reduce carbon output realistically is laughable on its face. They did after all actively participated in the decimation of the best and biggest source of carbon free power they had, by interfering in the ability of Vermont Yankee to obtain long term power contracts. That is what ultimately along with subsidized natural gas lead to the demise of VY. Only in VT can a bold faced socialist purport to be a free market supporter. A key part of “regulated utility” is the regulation. GMP, as a regulated utility, is limited as to how much profit they can make (and it is an admittedly generous allowance). But the money used under the Essex Plan to buy down electric rates is not additional profit. Overall rates are reduced so income is reduced, this “subsidy” is not additional gravy, it replaces money lost by lower rates. The idea behind any proposal like pricing carbon pollution is to change consumption behavior to reduce carbon emissions. Change is uncomfortable for all of us. And it always comes with unforeseen impacts. Shifting a significant portion of our energy use from carbon based fuels to cleaner and renewable energy is a major change and is disruptive, but it is an essential change. We are already seeing the multi-billion dollar impacts of climate change resulting from unfettered used of carbon based fuels. Doing nothing is not an option. Ah, not so! Remove the government subsidies from your wunnerful renewables and you end up broke. 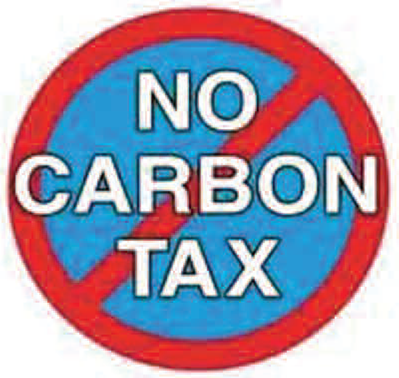 In my evaluation these carbon tax proposals generally would be very destructive to the VT economy if ever enacted. When I read these proposals it strongly reinforces my decision to move out of Vermont in 2016 due to the legislature’s policy tendencies and my assessment that it was not going to change in a timeframe short enough to satisfy me. As long as the electorate continues to put these people in office and trust funds continue to fund the advocacy groups Vermont can expect to continue on its glide path to greater economic problems. the only way a carbon tax works is if its on a national basis (level playing field) but that would push more jobs to Asia on a nationwide basis.